In the words of my one of my favorite movies ever (Grease)-- "Summer lovin', it happened so fast"... But actually. Loving summer. Literally. It came so fast. How is it June already?! The only thing that settles my fears and nerves about how fast time is actually flying is through the fact summer means we're in the midst of probably some of my most favorite fashion to hit stores. Summer to me signifies cute patterns, prints, colors, and a whole endless array of options to mix and match playful pieces and brands. So for today's look, I put together what to me is like the most perfect summer ensemble. With the cutest lemon tree dress (this is from Abercrombie, say what?!?! 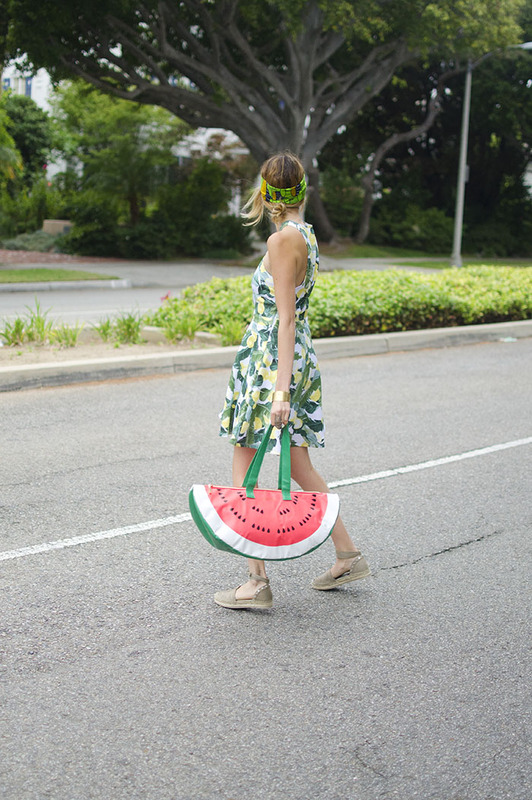 ), fun patterned turban headband, and amazing watermelon bag-- this outfit is seriously making me want to plan my next getaway asap!